An iPhone 3G seconds before its demise in a blender, Marketing genius it is not, but watching a bloke killing a brand spanking iPhone in a blender really is quite entertaining. 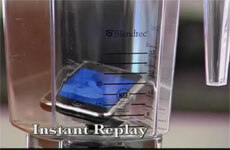 American company Blendtec runs a series of videos on its website that show various items being thrashed to death in its Total Blend product. The carnage ranges from unopened cans of beans to Nintendo Wii remotes and even a copy of videogame nasty Grand Theft Auto IV. It's far from being intelligently-scripted content, but the series has proven hugely popular. A large selection of Will It Blend instalments is available on the site. "Tom uses his new iPhone 3G to stay organised," reads the blurb. "Watch what happens when he tries to blend his old iPhone." See if you can guess what - in true American comedic tradition - happens next. Check out this wanton destruction of desirable gadgets here.